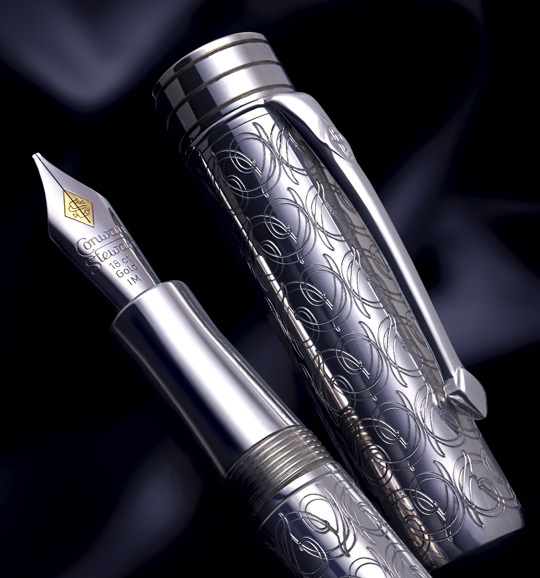 Below are pictures of the pen which also has twice as much silver as the original divine proportions. 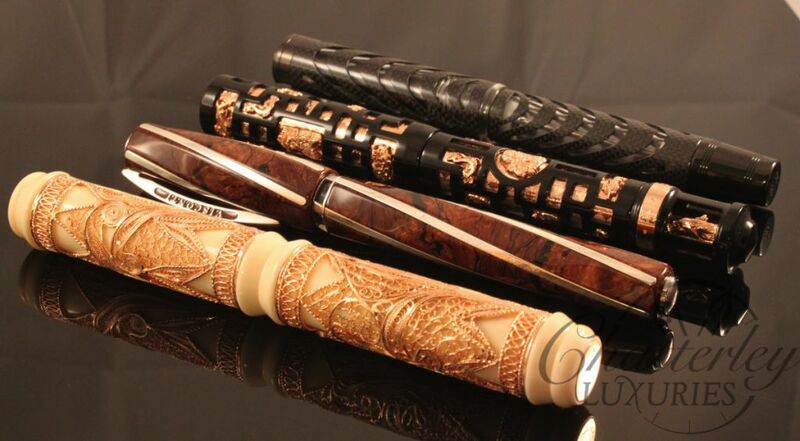 Here is a video of how they make these pens. Also featured is the included crystal inkwell, which is very neat, possibly the best inkwell that anyone has ever produced. 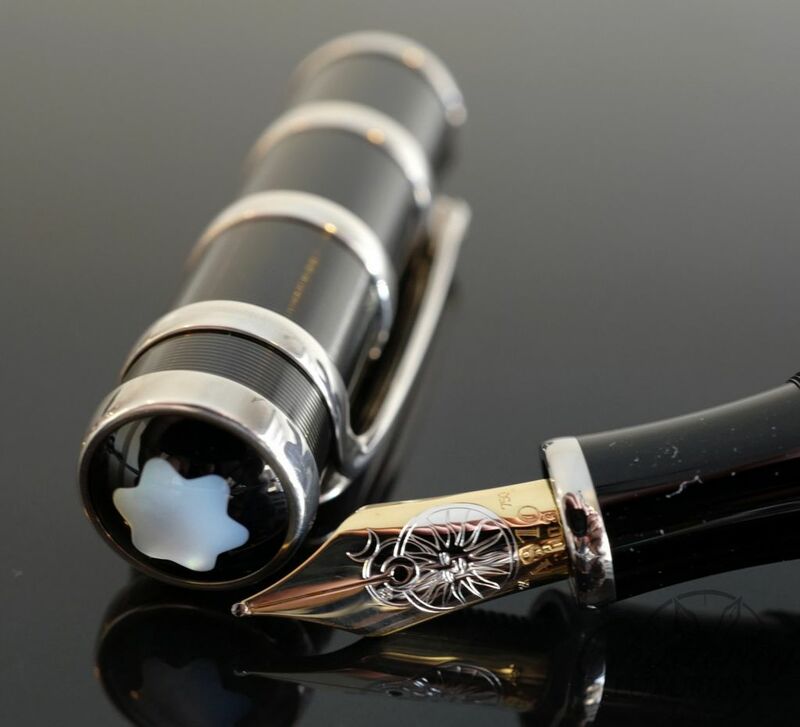 It is a showpiece that is very functional, the inkwell has a place to put the pen into and the pen rests on the top of the inkwell, in the holder. Unscrew this top to reveal a fairly large capacity inkwell. This inkwell is included with the pen. 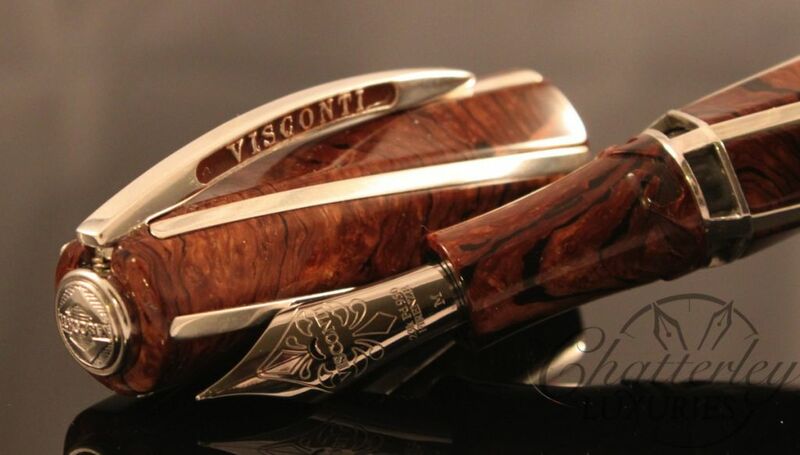 The last picture shows all 4 of the 25th anniversary limited edition fountain pens that Visconti released. Without getting into great depth we can say that this number, also called phi, is as well used to trace different circles divided through ten – called decagons – or through five – i.e. pentagons, called pentagrams or pentacles too. 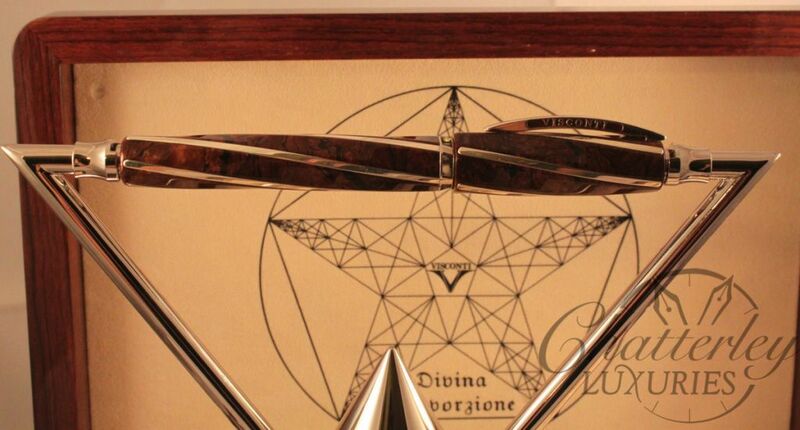 The empiric discovering of the golden ration “comes from the most remote ancient times, from the prehistoric era”. We presume that our ancestors learned very soon how to trace and divide circles; they of course privileged the division of circles through five, because of the five fingers of the human hand. 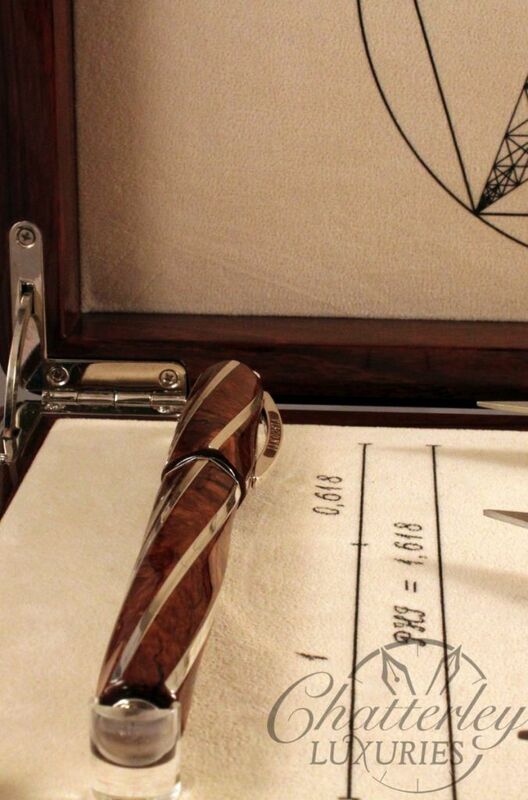 These are in fact “obvious” numbers indeed they lead to the natural calculation of some special proportions. However, only the Greeks, first of all Euclid, originally theorized these calculations. Before him Pythagoras – or at least his disciples – tried to disclose their mystery. Inside their sect, that was protected by the most absolute secret, the golden number was associated to the sacred, particularly to the five-pointed star – a symbol of life, beauty and love. 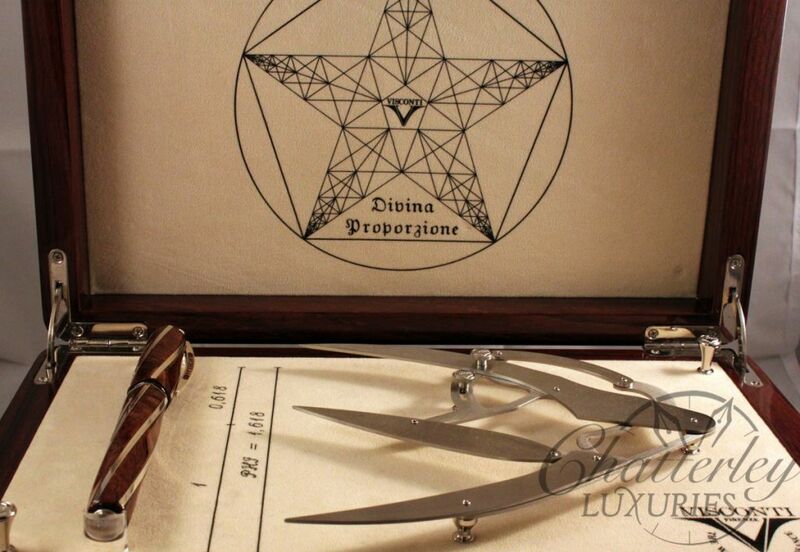 The pentacle is commonly thought to be the symbol through which the Pythagoreans recognized each other, but it came into our tradition throughout the centuries as a talisman of good health: we find it on some ancient coins and on several gothic cathedrals and churches. Also Plato recognized that the golden number had a privileged role in the explanation of the universe. During the XII century, Fibonacci, also Called Leonardo da Pisa, mathematician, merchant and great traveller got in touch with this scientific discipline in the Middle East, developing the famous “Fibonacci sequences”. For the architects and painters of the Middle Ages the pentagon became the symbol of the “Quintessence”, literally said “the fifth element”, i.e. absolute perfection, ideal beauty. The pentacles and circles traced with the compass were kept absolutely secret among the corporations. In 1509 Leonardo Da Vinci illustrates De divina proportione, the work of a Franciscan mathematician, Luca Pacioli. This book with pictures by Da Vinci had a great success, as it was the written version of an ancient oral tradition. It was revealing a mystery. Today we know that the divine proportion is present in architecture (Le Corbusier frequently used it), in painting, in music, in the structure of some poems, but also in nature, in many plants and animals (many flowers have five petals, some leaves are placed on stems according to the phi ratio, which is present also in the starfish and the sea urchin). The divine proportion seems also to rule the human body: the navel, for example, divides the body according to the golden number. 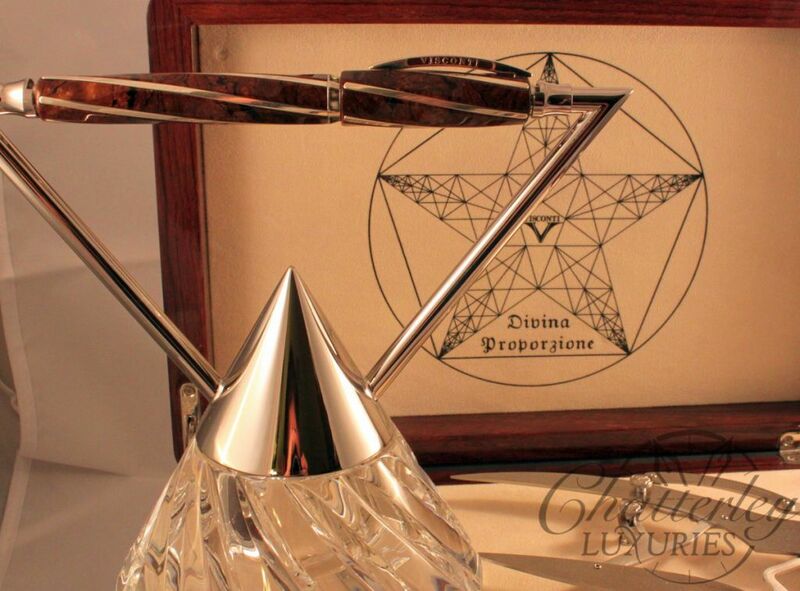 This anniversary pen is part of a limited edition of 25 pens worldwide, and features a beautiful briarwood presentation box. 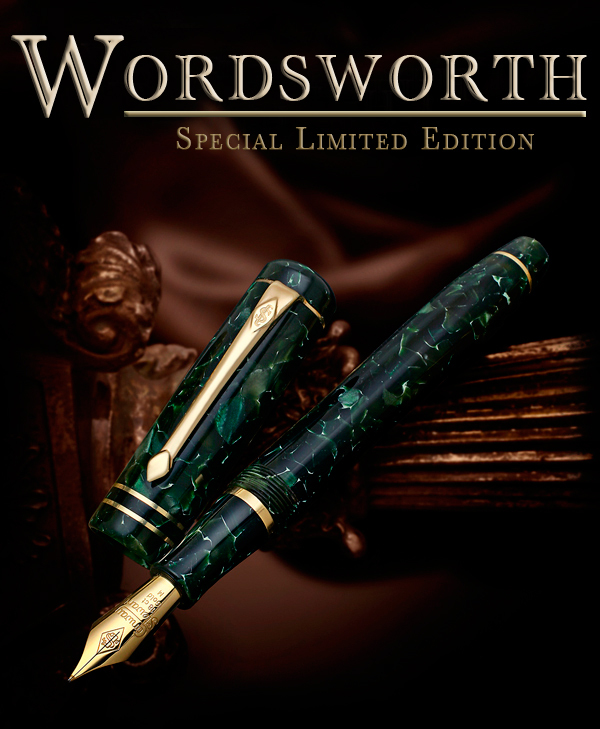 The pen is made from a burlwood celluloid, with solid sterling silver trim. 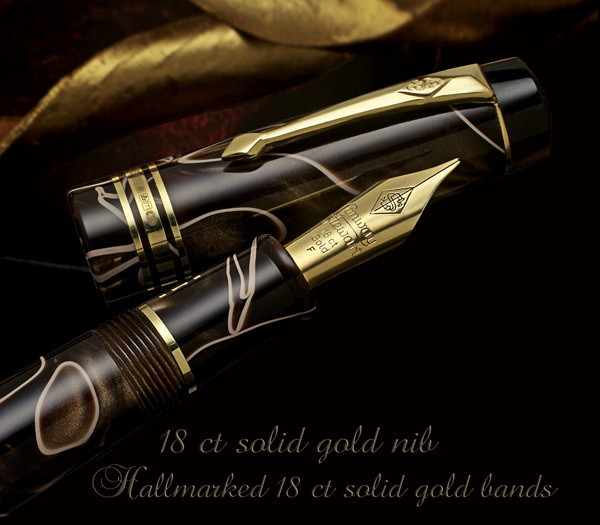 Visconti has installed a touch-down filling system and selected a 23kt Palladium nib for the pen. MSRP $3,250, we were able to get number 2/25 in stock.